Today is Paige's Blue Day in Kindergarten. The Trio has three sections, two squarish and one long space. The long space here holds waffle pretzels and a string cheese. One square section has four mini ham and cheese sandwiches and almonds. 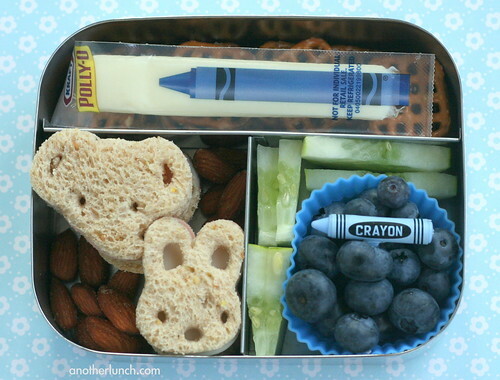 The sandwiches were cut into the little animal faces, an elephant and a bunny, using this cutter set. Cutest little cutters ever. They are my favorite and my best. The second square spot has as silicone cup of blueberries with the blue crayon pick and some cucumber slices fill in the spaces around it. Did the string cheese come with a crayon label or is that a sticker? That is a very cute cutter set. Did one sandwich make 4 little ones or are they bigger than that? Meredith, I use large sized bread (Arnold's multigrain) and out of one slice of bread I could get 4 animal cutouts, enough to make two mini sandwiches. I used two slices of bread to make the four complete mini sandwiches. These cutters are not itty bitty. An adult would be able to eat one in one bite- a big bite. For a child they are about two bites each, I'd say. Thanks! The stencil cutters I've had for 2 years have yet to work well on bread, so I appreciate your comments. This is so cute! All your lunches are so inspiring to me! My kids are starting school on Monday and I am so excited to make their lunches. :) I am wondering though, I have been searching all over the internet for the exact four square lock and lock boxes that you use.... I cannot find them! I found one with dividers but not the removable parts. Do you know where I could find the exact one that you use? Thank you so much!